I'm desperately hoping that someone out there has been cataloging examples of landscapes wholly transformed into a scientific instrument — from the ancient to the cutting-edge, from National Science Foundation proposals to the indulgently speculative, from the merely giant to the crazily monumental. It's an index that may have been retroactively instigated by BLDGBLOG's recent look into arctic sea ice “instrumentalized” into floating earthquake sensors. Perhaps the IceCube neutrino detector? If there's no such archive yet, let me help out whoever wants to start it by suggesting, in addition to the aforementioned examples, that the ARIANNA neutrino detector array be included in the list. 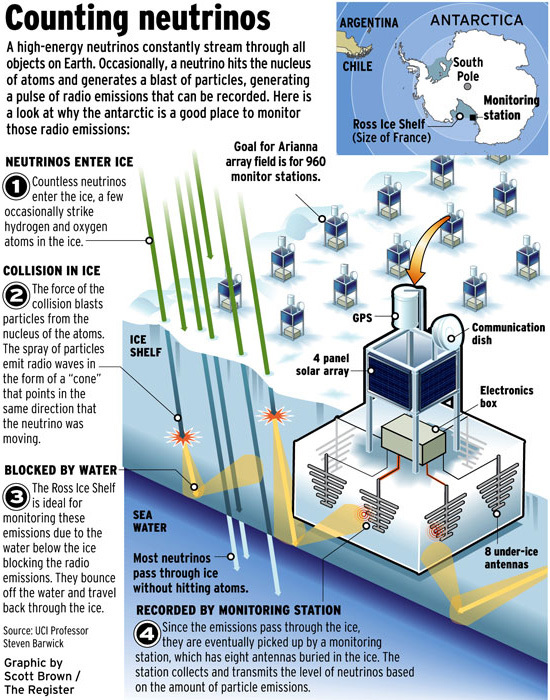 ARIANNA stands for Antarctic Ross Ice Shelf Antenna Neutrino Array. 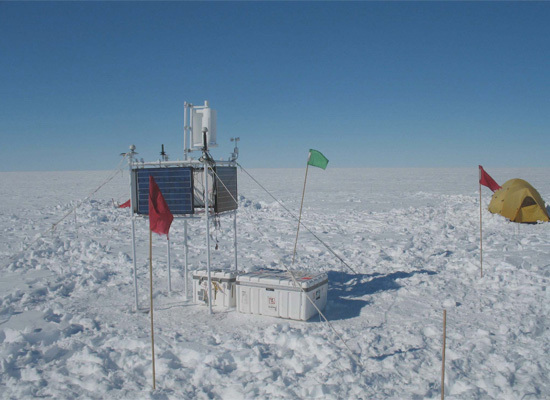 As its full name indicate, ARIANNA's array of monitor stations will be spread out across the Ross Ice Shelf. 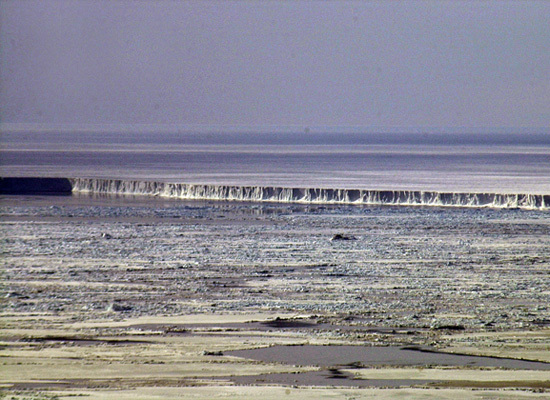 If the planned 10,000 stations are deployed, they will cover a 900-square-kilometer expanse of ice. Unlike the IceCube, ARIANNA will be looking for a different kind of neutrino signal. Here's a diagram explaining how that signal is produced, and why the ice shelf is ideal for monitoring it (which has something to do with the reflective quality of the ice-water interface). Given my limited knowledge of astrophysics, I'm left here imagining a National Science Foundation paying for the installations of hundreds of thousands of neutrinio monitors over the entire Ross Ice Shelf, thus turning it into an astronomical observatory nearly the size of France. Now and then, it breaks off a tiny piece, birthing a satellite detector. When the planet heats up, then one detector turns into hundreds or maybe thousands, all swirling about in the Southern Oceanic gyre.